FA Scott Burk, Chris Cantwell, 1981. A great two-pitch adventure, this route was ignored for decades, and for good reason. The bolts were almost all hangerless ¼” stud bolts, nearly impossible to spot among the knobs and lichen. Not only did you have to bring keyhole hangers (or use the wire of a nut to sling the bolts), the bolt type was weaker than standard ¼” bolts. Now, with all the bolts newly replaced, Flintstone is posed for popularity, especially with the wildly exposed second pitch. This and the chopped route Skeletal Remains (the dike at the far right end) were named in the theme of dinosaurs, since for some climbers at the time, East Cottage Dome was called Dinosaur Dome. 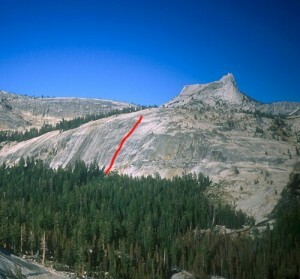 Despite being the oldest sport route at the dome, this route has seen nearly zero traffic, and it has large knobs, many of which (especially at the top of the second pitch) are likely to break if cranked or stepped on (use suspect knobs lightly). A 70m rope is required to lower off the second pitch. Which SuperTopo guidebooks include a topo for Flintstone?